great project, I love it and hope I get such a card in future...!!! This is an awesome project. You hear about Timbuktu in movies, when people are referring to a very exotic place; getting a postcard from there, would be a dream come true! I had heard of this project before, and I think it is time for me to buy one of the postcards. It is amazing how at one time this was a important centre of commerce of the ancient world. It is a shame that such an interesting place is almost off-limits to travellers. Please note that for your participation to be valid, you have to share a fact that you have learned about Timbuktu on your comment! One fact I have learned about Timbuktu is that it was first settled in the 5th Century BC... that makes it a very old city! I have learned about Timbuktu. This was once a town well known for the trade in salt, slaves, gold. So I love this project! Fact- located on the edge of the Sahara Desert, this has an estimated population of 32,000. A great projekt, and really a good way to make the world a better place! I have learned about Timbuktu that even if it's located in Mali (where people mostly speak French) the most inhabitants of Timbuktu speak "Koyra Chinii" which means something like "town language" - I would love to receive a card from there, maybe with one sentence in this language. What a wonderful sponsorship project! Sounds like an amazing place hit by huge tragedy. I'm glad postcards are helping those in need! Timbuktu is twinned with Hay-on-Wye, on the border of England and Wales. They are only a port city when the river Niger floods in December /January. The Ostrich the worlds largest bird , fastest runner was once a item of commerce trade for Timbuktu, the feathers were wanted in the world. Other birds notetable to the area African Jacana found on the shores of River Niger, Long tailed starling. With its rich history, it is a shame that is has fallen to bouts of terrorism more recently. Fascinating that mail is carried via motorcycle as well as trucks and airplanes! The land is dry and dwindling water supply as well. War-torn and working hard to survive. Thank you for sharing this information. My heart aches for the people. What a fantastic idea! I was encouraged to look up Timbukto to learn some facts and found out the name Timbukto can also be spelt "Tinbukto", "Timbuctoo" and "Timbuktoo"....thank you postcrossing for opening my eyes to this little jewel of a place! My fact about Timbuktu is that it is very hard to get there. The nearest passenger airport is a 20-hour drive from the city and a lot of the drive is not on good roads. Although French is the official language spoken in Mali, around 35 very different languages can be heard in the country as well. A long time ago I read a travel book by René Caillé, the first European to visit Timbuktu and come back, in 1828. It was then a mythical place. There are three key people in the history of the mythical city of Timbuktu that were born in what is now known as Spain, three figures recognized for their knowledge, their art and their military capacity that make up a shared past unknown to the general public. These three historical figures are the poet and architect Abu Isaq Es Saheli, the santón Sidi Yahya and the military leader Yuder Pachá, born in Granada, Tudela and Cuevas de Almanzora, respectively. Timbuktu is also a UNESCO World Heritage Site, since December 1988. Unfortunately, the extremists have destroyed much of the heritage. UNESCO UNESCO created a special fund to safeguard Mali's World Heritage Sites, vowing to carry out reconstruction and rehabilitation projects once the security situation allows. Timbuktu is located on the southern edge of the Sahara 15 km (9 mi) north of the main channel of the River Niger. The town is surrounded by sand dunes and the streets are covered in sand. The main crop grown in Timbuktu is rice, which is irrigated from the River Niger. It's remarkable how people can adapt to their environment, and work with what they're given! I've heard before about Timbuktu in movies and books always related to adventures in quite an unknown and mysterious place that was once very important in the past! Oh wow. The bustling city in the past is now a deserted place... but that place was an Islamic University hosting place, and African literacy hub! Interesting. I've learnt that the name of city Timbuktu may have Berber origin. The Tuareg founders of the city gave it a Berber name, a word composed of two parts: tim, the feminine form of In (place of) and bouctou, a small dune. Hence, Timbuktu would mean "place covered by small dunes". We learned that travel to Timbuktu via air first became available in 1961. Sad to hear that Timbuktu, once a thriving hub of bustling activity is now a struggling place due to dwindling water supplies and years of war. Hearing this makes me want to help in some way - one postcard at a time! I learned that Timbuktu was very important for islamic learning between the 13th and 17th century. It collected many different documents and was filled with knowledge. Sad to think that a once so flourishing city has become almost forgotten. I learned about the Tuareg people of Mali- their history, culture, and present day struggle. I also discovered a love for assouf music! WOW! I learned that the Sankoré mosque, also known as the University of Sankoré, was one of the first universities ever built in the world! Would love to receive a card from there! What a great project! I did not know that Timbuktu would receive any tourists, but learned that most tourists visit Timbuktu between November and February when the temperature is milder. I'll get one card sent to my niece, who introduced me to postcrossing! What an amazing project! I hope it gets lots of support and encourages similar projects in other communities. Fascinating fact: the lowest temperatures in Timbuktu occur in December, January and February (northern hemisphere winter months), but the average maximum temperatures do not drop below 30 °C (86 °F)... not what I’d call wintry temperatures!! Great story !!! I did not know that Timbuktu is in Africa so far. It has several sister cities, one of which, Chemnitz, I have been to! I have not been to one of it's other sister cities, Tempe, AZ. HA! Just bought one myself - you could do the same instead of hoping for one of the five cards kindly sponsored by postcrossing.com and provide a little additional support to the project. Timbuktu has UNESCO sites: three mosques and 16 mausoleums or cemeteries were selected from the Old Town for World Heritage status. Timbuktu or Tombouctou in French... I've heard about this place several times but last time I remember is when some people saved thousands and thousands of old records, old books, manuscripts written between the 17th and the 19th centuries or even older. They saved this huge collection of unique books mostly written in Arabic and in an African language from fire (some terrorists wanted to destroy them). A part of their culture has been saved ! I have learned about the Timbuktu Manuscripts, a collection of manuscripts. "These are copies of older works known in the Arab-Muslim world as well as original local productions, mostly from the 17th to 19th centuries." Great way for the people to make money. It's surrounded by desert which is interesting because not many cities or country can say they live in a desert. Also that is located in Africa I find that fascinating. As a child I often wondered if Timbuktu was a real place. I would hear people referencing it. I found out later on that it is real! I learned that Timbuktu was a popular trading centre of gold, ivory, and salt. Also, there is evidence of people living in the area as far back as 400 B.C.! Thank you for sharing this story! I know that in middle ages Timbuktu was considered the most enlightened Muslim city. The ancient manuscripts of Timbuktu, contained in private collections, completely refute the view that in Africa there was no culture of writing. In Timbuktu there were huge libraries, a large number of schools where they taught rhetoric and explained the basics of interpretation of sacred books. The city has preserved the most beautiful mosques built of clay — they are still impressive for their unusual shapes. It is believed that the great Gaudi drew inspiration for his buildings in the contours of the mosques of Djenne and Djingarey-ber — one of the largest and most beautiful in Mali. Since 1989, all the Adobe houses and attractions of Timbuktu are under the protection of UNESCO. Interesting! I’ve been learning French on Duolingo- do that would be useful in Timbuctoo! What an amazing project for atimbuktu travel guides that need help. As you know I have a company or Augmented Reality Postcards (www.martechgroup.es), I’ll be happy to make an AR postcard of the City for they to send, and send them there if we can find just a printing and sending sponsor. What a great projekt and I would love to get a card from there. I've learned about Timbuktu that some years ago terrorists destroyed their UNESCO WHS. .
Timbuktu in on the edge of the Sahara Desert. I have visited the Sahara Desert but not from the Timbuktu side. Very interesting article and one which leads me to want to learn more. A great project! One of my dream is to see this city also called "Pearl of Desert" or "the city with 333 saints" If you want to know more about life in this area you can look at the beautiful film called "Timbuktu", dated 12/2014 and made by Abderrahmane SISSAKO. Great idea, it would be fantastic to get a postcard from Timbuktu. I had no idea before that Timbuktu is so old, settled in 5th century BC and a permanent settlement in early 10th century. I was in west Africa last year and sadly didn't get to Timbuktu as hoped. I was surprised at how difficult it was to find postcards, post offices, and stamps. I was traveling with the Ghanaian exchange student we hosted 7 years ago. Her family along with most others had no mail carrier delivery, nor even a precise street name or number! Timbuktu became part of the current Republic of Mali in 1960. Presently sadly it is impoverished and suffers from desertification. Let us all order at least one postcard to help Phil, Bintou and Ali supplement their income. What a great place to get a card from and also help others less well off than ourselves. Wow great insight, the fact that I learned was that they weren't always a struggling city. Its sad to hear the fall but spreading awareness like this is what they need. And to be completely honest this post also validated the existence of the city. Best wishes to everyone reading this. "Timbuktu has long been used as a metaphor for "out in the middle of nowhere." Tibmuktu means "The well of Bouctou". I learned about precious Timbuktu Manuscripts that are in libraries but in need of preservation. A great project that helps people that need it! The name Timbuktu might be from Berber language meaning "She with big belly button"
I enjoy watching the youtube video https://www.youtube.com/watch?v=j4V-QAzKQ3A. I learned that the city declined during the 1600s for several reasons: competition with trade and the monarch accused scholars of "disloyalty." It's pretty sad because it sounds like Timbuktu was once a thriving city but never really recovered. I wonder what things would have been like if it never declined.. This is a nice project! I did learn about how postcards travel from Timbuktu, it is really impressive! I learnt that people of Timbuktu speak a language called Koyra Chiini ! Timbuktu was named for an old woman left to oversee the camp while the Tuareg roamed the Sahara. Her name (variously given as Tomboutou, Timbuktu, or Buctoo) meant “mother with a large navel". What a lovely project! I've known that Mali once was an empire and Timbuktu used to be a settlement situated on the crossroad of 5 caravan routes at the edge of the Sahara desert before. AMAZINGFACT-It is in Mali!!! JK...on a serious note, it is home to one of THE oldest universities, which was established somewhere in 982 CE.....seems it was an intellectual hub too, in 12th century!!!! I didn't realise thatTimbuktu was a regional trade centre in medieval times, where caravans met to exchange salt from the Sahara Desert for gold, ivory, and slaves from the Sahel, which could be reached via the nearby Niger River. I guess that is why it became such a well known place. This is great project! I heard about Timbuktu when I was a child in some legends, but I didn't know much more about it till now. I learnt that Timbuktu was a centre of education from 13th to 17th century and the legacy of this famous period is in the Timbuktu's manuscripts. Oooh, Timbuktu! There used to be a commercial here in PH mentioning Timbuktu when I was young. We do know that it's in Africa, but I didn't know their situation right now. I've imagined agriculture in the place, and I didn't know that they have a good history. Timbuktu became a permanent settlement back in the 10th century, It is located on the southern edge of the Sahara. Thank you for the information about Timbuktu! It is very interesting project! Timbuktu is an ancient city in Mali near Niger. It was one of the largest centers of caravan trade in North-West Africa, had a strategic position on the southern border of the Sahara. Near Timbuktu there is a lot of ruins, testifying to the past greatness of this center of civilization. In Russia there is a children's song about the fabulous city of Timbuktu. Amazing that you are supporting this project! I didnt know about Timbuktu. I didnt know that it was an ancient city in Mali. I didnt know that it suffers from desertification. Now, I know much more about it!! Thanks for sharing it! Timbuktu has three mud clay mosques which are World Heritage Sites. I think the buildings are very unusual and interesting, I#ve never seen something like that before. Wow didn't know that Timbuktu has been around since 5 BC. I always thought that it was a Mystical city, like Atlantis. Well I learned something "new" today, Thanks for the history lesson. Huh. I don't think my comment posted the first time. Okay, I learned that Timbuktu is in an African country named Mali. I never heard of Mali before, but I knew there was a city named Timbuktu. Thank you for supporting this project and creating awareness. I had found it online about a year ago, but didn't know if it was legit. I learned that they grow rice there, with the help of the River Niger, it's Timbuktu's main crop. I can't even imagine how different life can be there than here in Scandinavia, agricultural wise as otherwise. This was an interesting article thank you for sharing! Wonderful idea, easy and so creative ! Did you know there are 'Aardvarks' in the North of Timbuktu, in the Sahara? I like them and I think their name is funny. My fact- each year in Timbuktu is Desert Festival. Many people and artist go to Timbuktu for this occasion. Today I learned that Timbuktu is a city in Mali, a witness of a magnificent past, located near the Niger River on the edge of the Sahara. It would be nice to get a postcard from Timbuktu. All the way to Timbuktu, seemed always very far away. Just coming back from a trip to the South of Africa, I read this story with a lot of interest and learned more about Timbuktu and Bamako,both places in Mali. Thanks to Postcrossing. I love this! I would like to be entered please. A couple facts I learned is that the spelling of Timbuktu has changed over the years, and also Although French is Mali's official language, today the large majority of Timbuktu's inhabitants speaks Koyra Chiini, a Songhay language. I learned that the first European who reached Timbuktu Alexander Gordon Laing, did not arrive until 1826! Timbuktu has so reach history and is beautiful! When I was little I thought it's a place from legends and myths... with this beautifil, special name which little child thinks it's a real place? :) It's a great project, thanks for it! I learned that Iron Age settlements have been discovered near Timbuktu! Wow! A fact that caught my attention: In its Golden Age, Timbuktu's numerous Islamic scholars and extensive trading network made possible an important book trade. Books are the best! Thanks for drawing attention to this business (and for drawing winners)! I had no idea that this was a real country! This blows my mind! I thought it was just a saying... “you took ages! Where did you go to? Timbuktu” What a great project. What a lovely project! Thank you for bringing it to our attention! Postcrossing is an educational experience for me. Timbuktu is near the Niger river, and was a trading post on the trans-Saharan route. Historically, it was also the centre of Islamic culture. Well, today I realized that Timbuktu is situated in Mali. I knew that it is somewhere in Africa but I wasn't aware of the country. Thanks to Postcrossing for this amazing project. When I was a child Timbuktu was often mentioned as a point at the end of the world. Today I am sad to learn of their struggles. Thank you for the link & for educating me! Timbuktu is a name that our family has thrown around as long as I can remember, used to denote a remote spot on the earth -- but it might as well have referred to another planet, because I never knew one thing about the actual city until now, or at least did not remember anything. I just learned that it is in Mali, whereas I think I mixed it up with a place on a different continent altogether. This is a wonderful project! It´s remarkably what a big trip a little piece of paper must travel to go outside the country! I know Timbuktu is somewhere in Africa, but unfortunately not more about it. And I really like Ali Farka Touré's words "For some people, when you say 'Timbuktu' it is like the end of the world, but that is not true. I am from Timbuktu, and I can tell you that we are right at the heart of the world." I found that there are really beautiful deserts and amazing Mosque! And that average temperature of August is 36.5 degrees (in some days I have the same in my city :D). Timbuktu was under French colonization from 1894-1960. It lies only a few miles from the Niger River. I even have an old globe which shows it located in French West Africa and it is the French spelling Tombouctou . Being a librarian, I decided to check out libraries in Timbuktu. The Ahmed Baba Institute has one of the largest collections of older manuscripts, nearly 30,000, and is working to restore their condition. And I would love to win a card, but regardless, I am happy to help the people there on my own. Vive le Timbuktu! Even though French is the official language, a large majority of Timbuktu’s inhabitants speak Koyra Chiini. Timbuktu is located on the southern edge of the Sahara and is surrounded by sand dunes! When I was a child my family used to say that, “going to Timbukto” was like going to somewhere impossible or unimaginable. In fact, I didn’t know that Timbukto was really an actual place until I was an adult! What a great project this is! I also think I may order a card as well! I learned that the origin of Timbuktu's name is uncertain. I'll go with the Berber origin meaning "place covered by small dunes". As the post describes it was one of the really wealthiest places on earth during ancient times. Gold was flooded in market as mere vegetables. I just learned more about Mali in a YouTube channel called Geography Now: https://youtu.be/5Twr04-ViR4 hope someone enjoys learning. Mud structures adore the entire Mali and some of them which dates many years back still satisfies your Wanderlust. Research of the magazine "Forbes" put Timbuktu in the top ten cities likely by the end of this century disappear from the face of the earth. Citizens, the government of Mali has taken measures to ward off Sands and once again make the earth green, in particular by planting trees. But these efforts are ineffective, some parts of the city already half buried in the sand... I wish the citizens of Timbuktu luck and strength for the salvation of their city. We used to have a saying in the UK - "where is it" or "where are you going" - Timbuktu?, meaning unrealistically far away - probably this is still a saying. I’m a history teacher and I teach about Timbuktu in the Middle Ages, when they were a trading center for gold, salt, etc. This postcard idea is so cool!! I have learnt that Timbuktu is an oasis town about 20 km north of Niger River. I've learned that Timbuktu is an UNESCO World Heritage Site! This is a great project! I looked up Timbuktu and found out that it is the capital of the Timbuktu Region, one of the eight administrative regions of Mali. It had a population of 54,453 in the 2009 census. I wonder what the population is now? Timbuktu has long been an invaluable source of medieval Islamic texts. But saving precious cultural treasures has been difficult in recent years of war and unrest. The spelling of Timbuktu has changed a few times. Timbuktu - historically important as a trading post on the trans-Saharan caravan route. It would be exciting to open my mailbox and find a postcard from Timbuktu! Timbuktu is a ancient city in Mali with a very sad History. I'll support the project by sending some postcards from over there. How wonderful for Postcrossing to support this project. I just learned that in its Golden Age, Timbuktu was a scholarly center of Africa. Also, it is always HOT there. The main agricultural crop is rice. As a language enthusiastic it was interesting to learn that French is Mali's official language but the most of people speak a language called Koyra chiini! I think it would be a great idea to do this. I hope they have great success! It would definitely be worth paying for a card from Timbuktu! Very cool. I honestly didn't know Timbuktu was a real place. I learned the spelling has changed over time. I did not know Timbuktu was a World Heritage Site. I will purchase some postcards from Phil, Binto and Ali for sure! Timbuktu was founded in the 11th century and it became a major trading centre primarily for gold and salt. I know Mali the country but didn’t know that it’s capital is Timbuktu. A young lady who braided my hair was speaking a language I never heard before, she said it was Bambara...French is the main language of Mali, but I hope that Bambara makes a strong comeback! Great project!! I don't even have to check the link to know of Timbuktu's wonderful manuscript collections and how they have been saved more than once, by resourceful people willing to die to preserve a bit of all our history. Timbuktu was a regional trade centre in medieval times, where caravans met to exchange salt from the Sahara Desert for gold, ivory, and slaves from the Sahel, which could be reached via the nearby Niger River. I learned today that Timbucktu is a sister city with Tempe, Arizona! Sidi Yahya Mosque is a UNESCO World Heritage site, and it is at Timbuktu. Temperatures in Timbuktu never fall below 30 degrees Celsius! The streets of Timbuktu are covered in sand! I'm definitely going to look into buying some cards now. It's not a huge amount of money compared to so many other things I buy without thinking, yet can make such a difference to these people who are working so hard for a livelihood. I'm fascinated by the description that Timbuktu was a forested region that is now practically desert. The extreme changes that have been undergone by our planet are seen so vividly in places like this. thank you for the great idea of postcrossing! I like to send cards to strangers and get them from strangers. I have been in the project for more than 7 years, and during this time I have found many friends around the world. I heard about Timbuktu, but I didn't think there are some postcrossers. I wish a lot of Love, Light and Good to these people! I learned that it is in Mali and near the Niger River. I always thought it might be made up because in the South (in the US) we always thought it might just mean "in the middle of nowhere". Timbuktu is mostly Islamic so they don’t celebrate Christmas there. I once asked Postcards from Timbuktu to ask the sender to write about X’mas there And that was what they told me. They celebrate Muslim holidays instead. Oh, and you can ask them to make you a handmade postcard. The artists are schoolchildren with good painting skills for their age. I read that "The main agricultural crop is rice. African floating rice (Oryza glaberrima) has traditionally been grown in regions near the river that are inundated during the annual flood. Seed is sown at the beginning of the rainy season (June–July) so that when the flood water arrives plants are already 30 to 40 cm (12 to 16 in) in height." This is amazing. Thank you, Postcrossing, for once again making the world a smaller place and showing us that goodness does exist. That is such a great idea. I did not know that there are 4 different origins of the name Timbuktu. I also found out, after looking at a map of the city, that most of the roads go from east to west and north to south so they form little rectangles. From above, it looks similar to New York City. I'm so happy you wrote about this project on the blog! I have bought a card in the past and I had a great experience with it. You can have a postcard from a very special place and at the same time help the people living there. In the early 10th century, Timbuktu became a permanent settlement. Before that, it was seasonal. I love the idea of Postcards from Timbuktu, and I wish them much success! I am a reader, and I know that literacy and books were symbols of wealth, power, and blessings to the people of Timbuktu, and the acquisition of books became a primary concern for scholars in the 15th and 16th centuries. I learned that there are at least four possible origins of the name Timbuktu and that the spelling of the name has varied a lot over time. Thanks for the chance of winning a card from a very special place. When I was in middle school, we learned about different religions. I remembered learning that Timbuktu was a center of scholarly study in the Islamic world for hundreds of years. Thank you for spreading awareness about this incredible project and for so kindly offering Postcrossers the opportunity to win a postcard from Timbuktu! So thrilled to know about this. it's great to be able to get a postcard from this enchanting place in Mali. The biggest thing I learnt was how little I know! I know the name, of course, but I had no idea of the mythical associations nor how significant it was in terms of trade or enlightenment. I hope this amazing place isn't lost. Timbuktu was a regional trade center in medieval times, where caravans met to exchange salt from the Sahara Desert for gold, ivory, and slaves from the Sahel, which could be reached via the nearby Niger River. A fact I learned about Timbuktu is that it is located in Mali. I never knew which country it was in before. Thank you for this giveaway! What a wonderful initiative! I have now learnt that in the 16th century Timbuktu was the site of a major Islamic University! This is such an amazing read! I didn't know each of those cards were $10, that's crazy... maybe we can do something as a community to make postcards more available to postcrossers there? When we were on a 'road trip' and Dad got lost driving, Mom always said we'd end up in Timbuktu. I've still never made it there... Timbuktoo - so remote there was a prize for anyone who could go there and make it back alive. And it was won by Rene Caillie, a Frenchman. "From here to Timbuktu". Although it was one of the last stops of the Saharan trade route in its prime, Timbuktu was known for BOOK TRADE at the Sankore Madrasah (University of Sankore) which was established in the 1300's. I am a book and library enthusiast but until reading the linked Wikipedia entry, I never realized how much Timbuktu has contributed to the collection and preservation of manuscripts! I was amazed to learn that Timbuktu once had an extensive trading network made possible an important book trade and was once a scholarly centre in Africa. I have read that Timbuktu was the end of the world, Donald Duck said that haha. I read that funny word in a novel named Intelegensi Embun Pagi, written by Dee Lestari from Indonesia. In my other child magazine, they said Timbuktu have some gorgeous history to learn, the center of knowledge on it's time. I really want to see that place someday! Timbuktu is known as the “City of 333 Saints” because 333 saints were laid to rest in the city... Would love to get a postcard from Timbuktu. French is the official language but today the large majority of Timbuktu's inhabitants speak Koyra Chiini, a Songhay language that also functions as the lingua franca. So happy to see this project and what beautiful postcards!!! My comment is that I learned that Timbuktu is actually in Mali. For more than 50 years I have heard of Timbuktu, even saw it mentioned in various movies , not to mention saw it referenced on stamps in my collection but never realized exactly where it was. At this time I feel oh so Not smart ! The fact I learned is that there are several spelling for Timbuktu: Tombouctou Timbuktoo Timbuctoo. Also, some people think it’s a fictional place. Wow! What a great project! I learned a lot about Timbuctu also I was spelling it wrong all this years! For shame. Oh yes I also know that Mamoudou Gassama is from Mali! Life is very hard there and I hope this project helps a little. Fingers crossed for a postcard from Mali. In medieval times, caravans would meet there, as it was a regional trade center. Salt, which was a rare and VERY valuable commodity, was often traded for Gold, Ivory and other goods. The salt was sourced from the surrounding Sahara dessert. I learned that during World War II Timbuktu was used to house prisoners of war. Lots of history there!! I have no idea about where is located Timbuktu. I like Postcrossing because I can learn about rare Countries to me. I am going to read more about it. Very interesting to me. Postcrossing is great but I have to send cards to the same Countries, and I got cards from the same Countries. i would like to send many many many cards to Timbuktu. I read that: Timbuktu is still a legendary city, forged between gold and salt, whose extraordinary heritage is in danger, as the Franco-African tension in Mali increases. Timbuktu is an old city which owns long history.She witness the glory of Mali Empire and Songhai Empire,and I wish she will be a beautiful city soon. That is a good project for me to learn Timbuktu! In my understanding,The name of Timbuktu has always been associated with the Niger river. Africa's third largest river, like a full bow, full of strength and tension, cuts the southern edge of the Sahara and flows into the Atlantic ocean near the equator. Timbuktu, like the arrowhead that appears on the back of the bow, points firmly to the vast expanse of the northern Sahara. In this way, the geographical significance of this legendary city can be understood. I HAVE LEARNED THAT....Timbuktu was a regional trade centre in medieval times , and a very good place to hone your trade skills and barter gold salt and many more. Its a great place absolutely!!!! Thank you for sharing this. It is sad to see such a historied place end up on a back burner. I didn't realize how many camels it would take to deliver food to salt miners and to bring back the slabs of salt. Caravans of several thousands of camels would certainly have been something to see! Wow - I learned a lot - I didn't know the city is 1000 years old, or that it was an important part of the book trade (that's my kinda city)! :) Chemnitz, Germany is also as Sister City (Dusseldorf just recently celebrated it's 30-year Sister City relationship with Chemnitz a few months ago). I really hope the problems in the city can be reversed, & it can once again be a city of great learning & culture. I'd love to be able to visit. I learned quite a bit about it last year, helping my son study for AP World History tests. For instance, Timbuktu was part of the ancient Mali empire, and a major stop on the Trans-Saharan trade route. I hope everyone can go to Tumbutu to see the style of the ancient literary flower rendezvous and help the locals develop sightseeing. Growing up, I would sometimes hear the word "Timbuktu" from adults who would "threaten" about sending you to Timbuktu if you didn't behave. It wasn't until later in life that I realized there's an actual place called Timbuktu. Last month, BBC aired a show about it, with the journalist going on a camel journey to reach what is also known as the City of Gold. How wonderful to learn that there's a Postcards from Timbuktu project! I just learn about this project from your blog post, and find the idea to be a very smart idea for the locals to be making a bit of supplementary income despite the situation. So... fact I learned about Timbuktu: The fact that the ancient Mali kingdom was so wealthy thanks to it's trade routes from Timbuktu that, as a result of it's King, Mansa Musa, making a pilgrimage to Mecca from 1324 to 1325, he and his retinue brought with them such a MASSIVE influx of gold when passing though the markets of Cairo that they unintentionally devalued the precious metal for the next decade not only in the Middle East, but the entire Mediterranean! I've just learnt about this place and now I'd like to know more. But the most important fact that I knew now is that in this place live wonderful person. I hope I can visit it in future. It's very important project specially for people like me who lives too far from Timbuktu. I don't have many opportunities to know a lot about such events so Postcrossing is really an useful and kind project! Really great project... I did know about this place. And now to learn that a once flourishing city with riches of gold, ivory and a centre of learning is on the decline, makes me feel sad. I hope it can regain its stature some day. Ive learned that it’s avtually a real place! I had no idea (I know, shame on me 😦) but what a brilliant way to help the people of Timbuktu bring much needed funds into the community. Thank you so much for bringing this amazing project to our attention! I find it fascinating that 3000 weapons were burned in the "Flame of Peace" ceremony March 29, 2007 and a monument built in commemoration. This Festival au Desert celebrates the peace treaty of 1996 and the end of the Tuareg rebellion. The language of Timbuktu is, besides the French, Korya Chiini, the Songhay language. then lunch for them is ay cirkose. Of course this is the fonetic writing, as the language is written in the Arabic alfabet. I like that you're encouraging people to research a little about Timbuktu. I found this fact: a 2006 survey of 150 young Britons found 34% did not believe the town existed, while the other 66% considered it "a mythical place". Also, Tempe, AZ is one of its sister cities! Also participating, what a journey for a postcard! Timbuktu was a world centre of Islamic learning from the 13th to the 17th century, especially under the Mali Empire and Askia Mohammad I's rule. Wow I wonder how it became a such consumed place ? This is a worthy project. I had no idea how expensive it can be to write a postcard. I learned that the mean temperature in Timbuktu is 28 °C. It’s dry and hot. Timbuktu is an ancient city located in about the centre of Mali. It is listed in the Unesco's WHS. Its temperature is a bit hotter than Bangkok! I have learned about Timbuktu -the name alone sounds like a fairy-tale! Great history, god luck in future! Thank you for such interesting and useful information and also for support of people who live there! It is very expensive to buy post cards and stamps there! It would be desirable to receive a post card from there and also I want to send a post card there. The University of Sankoré was built in the 14th centrury. It was one of the first universities build and the largest university in the world at the time (25 000 students). I've learned that it's a great thing to support Timbuktu's people increase their income by supporting that project. Good luck! i dont know a fact about Timbuktu. Its too far from here and i havent learn anything in my school. After i read this blog, i only know about Mali before. So the fact about Timbuktu, i read all in this article. My son was in Gao, Mali, as a soldier and I learned a lot about about Mali during this four month. And most of it was the poverty and friendliness in this country, that deserves peace like every country! Timbuktu is located on the southern edge of the Sahara. The main asset of the city is more than 100,000 manuscripts, some of which date back to the 12th century. Today, Timbuktu is a poor city. City streets are filled with sand. I didn't know about this place. Thank you. What a great idea! Love music from Mali, and once read the beautiful book by Maryse Condé, Segou about the history of Timbuktu. A pity life is a struggle for the people there! In the 19th century Timbuktu was a legend and Europeans searched for this mystical city. It was very dangerous and even if they found the city in the desert, as Christians it was not safe for them to stay. The German scientist Heinrich Barth, however, made it to the city and lived there undercover for almost two years. He spoke Arabic fluently and made friends there. But when the people found out that he was a European, he had to leave. With the help of his friends he could escape. Today in Timbuktu there is even a street named after him and they still remember him. Interesting to read, how postcards can help. I really don't know much about Timbuktu, but would love to find out more! We need your help.I love meaningful projects and I support them.Timbuktu has a beautiful,but very sad history.I recommend the film Timbuktu 2014.https://www.youtube.com/watch?v=Cs2dYAlbINY.Even if a postcard from Timbuktu I don't get,I'll send it to someone else. pity that even when the cards physically out of Mali,stating the ID of their country.Or is there another way? What an amazing project! I was fascinated to learn about the fact that Timbuktu is surrounded by sand dunes and that the streets are covered in sand. This is so different from Holland, I cannot imagine the streets here fully covered in sand.. I have learned that Timbuktu was formally incorporated into the French colony of Mali at the end of the 19th century. Thank you for this really nice article. I tought that there is more population in Timbuktu. We are jokink at home, that when kids are wild, we will send them to Timbuktu. Sound to simple, why don't wie have similar Projekts in other countries too? Great idea which should be supported by our Community. The ancient history of Timbuktu includes nearby Iron Age remains, as well as Islamic universities. What an amazing place! I have always enjoyed learning about languages, so here is a fact: even though French is its official language, Koyra Chiini is spoken by the majority of Timbuktu, with Arabic spoken as a more scholarly language. Timbuktu Crossroad between the desert and the tropical parts of West Africa and UNESCO heritage! I know that Timbuktu is considered "the edge of the world"
What an amazing project! Thank you for getting Postcrossing involved in this. Great to read info on Timbuktu. I knew nothing about it, not even that it was part of Mali. I enjoyed reading the story of Shabeeny, who described Timbuktu as being surrounded by forests.... must have been an amazing place then. Love this CSR project - it never cease to amaze me how postcrossing can always find a way to help through postcards, amazing ..very well done! Thank you, Postcrossing, for taking part in this project. I've learnt from this blog post that Timbuktu while here I am complaining about the delay in the delivery of the postcards addressed to me, there are people whose outgoing mail take so many routes. Also $80 a month? That's like my budget for skincare. :( I hope it'll be peaceful there in the future. I would like to join in, too. Of Timbuktu I've heard something before, but until now always believed it would be a "fancy name"
Timbuktu is twined with Hay-on-Wye in the UK. Oh what a great idea and project! Interesting is that Timbuktu flourished from the trade of salt just as Hallstatt in Upper Austria. This is such a great project! I hope this blog post brings more business to these men and their country. I liked to read about the festival called the Festival au Desert, which celebrates a peace treaty in 1996 when 3,000 weapons were burned in a ceremony. I've learned that Timbuktu features a hot desert climate according to the Köppen Climate Classification. The weather is hot and dry throughout much of the year. Also, thank you very much for this amazing project! Timbuktu is home to around 60 libraries of different sizes. I havent know that Timbuktu exist 😳, shame on me. And this is a great project! And fact - Timbuktu is located on the southern edge of the Sahara 15 km north of the main channel of the River Niger. Although now held by the government of Mali, In July 2012 Timbuktu was captured Islamist rebels who captured the city from a secular rebel group in June. The rebels imposed sharia law, which includes mandatory veils for women, the stoning of adulterers, and punitive "amputations" for thieves. The rebels called for the destruction of all of the city's shrines, which they believe to be a form of idolatry banned by Islam. What a wonderful project! I learned at least that Timbuktu doesn't mean "at the end of the world". For the people living there it's a home as much as anyplace. What a fantastic project. Timbuktu has such a mythology about it based largely on its history as an Islamic centre of learning. It's fantastic how learning can create a Golden Age in all cultures. I have learnt that Timbuktu is a sister city to 6 other cities, for example Chemnitz in Germany. I think it is good to support the people there. Timbuktu was a regional trade centre in the Middle Ages, where caravans met to exchange salt from the Sahara Desert for gold and ivory.Today, the city is still inhabited, but it plays little role on the world stage. By the way the first European to reach Timbuktu was Alexander Gordon Laing. by this message. I hope the fellows keep up this postcard work ! Timbuktu has 6 sister cities. This includes one in the USA, Temple Arizona. Wow, what a fantastic project... What I have learned about Timbuktu today is that it is an UNESCO World Heritage Site. It seems a bit run down. Its location is at the edge of the Saharan Desert..
"To the people of Timbuktu, literacy and books were symbols of wealth, power, and blessings and the acquisition of books became a primary concern for scholars"
I am totally surprised to learn that postage from Mali to Europe costs $2.20! That's so much money for the local people. I will really take a look at supporting this group. All the best! I saw the movie Timbuktu, it's very beautiful, I understand why it gots awards. I also know that the population makes the mosquea new each year, because it's built whit raw earth. What a pity that the war makes this place so insecure ! I've lernt that most buildings there are made of clay and that Timbuktu is also used as a synonym for a place far far away. As you know Timbuktu is on the UNESCO World heritage list. But did you know that Timbuktu was one of the 21 finalists of the New Seven Wonders in the world contest in 2007 ? Please do not enter me into the drawing BUT I wanted to say I just ordered a postcard from them because I think that it is a good way to give people employment and extra income. $10 was not too much for me.....but hopefully, it will help them. I am inspired by their initiative and creativity.....what a great way to show the world the beautiful country of Mali! I found the history of Timbuktu fascinating as salt has a large part to play in our local history as well. Our salt was transported on river barges whereas in Timbuktu there were large caravans of several thousand camels taking three weeks each way, transporting food to the miners and returning with each camel loaded with four or five 30 kg (66 lb) slabs of salt. The salt transport was largely controlled by the desert nomads of the Arabic-speaking Berabich tribe. Although there are no roads, the slabs of salt are now usually transported from Taoudenni by truck. From Timbuktu the salt is transported by boat to other towns in Mali. Great project. Thank you for bringing it to my attention. tim, the feminine form of In (place of) and bouctou, a small dune. Hence, Timbuktu means "place covered by small dunes"
Wow it definitely a great project! It's my first time heard about this place! By looking up the information, I can't imagine it used to be a center of learning and trading, and it even got the world's earliest university! It really broaden my horizon and I will support the project in the future! First time I heard about Timbuktu in a book called The Travels which was written by Ibn Battuta, a muslim explorer. That book really worth reading. Hope someday I can follow his path, go traveling to Timbuktu for watching those monuments. This project is so meaningful and I'm so happy because they can earn a living by this way. Every small order we make will be a big matter for them. So glad that I can do something to help the people there. It's proved to me again that the world is full of warmth. but the word of God and wisdom are from Timbuktu. " Wow! What a great project! I have learned that the Berber name of Timbuctou actually means "place of small dunes." Fascinating! Sankore Madrash is one of three centers of learning located in Timbuktu. The Sankore Mosque has a section built using a honeycomb design and is built in a pyramid shape. Let us hope that the people of Timbuktu will see brighter more prosperous days. It is so sad that places such as Timbuktu with so much history and culture are to destroyed due to the irrationality of religion. I hope this project helps them rise and become stronger. What a great idea and project this is! I only knew Timbuktu as a kind of joke. I'm going to Timbuktu! It means I'm going very far away! I never realised that it is a city that already exist in the 10th century and it has such a great history. So many different things have happened there. So Postcrossing brought Timbuktu nearby! Thank you for supporting this project and sharing it with the Postcrossing community as an opportunity for us to help others. As a librarian, I am always interested in other country's library systems and/or efforts to preserve information. I learned that Abdel Kader Haidara, organized to have 350,000 medieval manuscripts smuggled out of Timbuktu for safekeeping. Important work! I learned that French is one of the major languages in this country =D and Koyra Chiini =D these cards are beautiful! I learned about desertification- a word I never heard before...meaning that by either climate change(natural or human created) and over use, the land becomes too arid and unusable...and water is severely lacking. The people are already impoverished. I can't imagine how much worse this can get. It is heartbreaking. During World War II Timbuktu was used to house prisoners of war. Great idea! We’d love a card from there! What a wonderful giveaway! Thank you for sharing this wih us. I have just learned that Timbuktu is a city in Mali which is on the Africa continent. Coincidentally, it is also a UNESCO world heritage site which is a card of my wishlist. The first and most important fact I learned is that Timbuktu exists! It was also amazing to learn that no European stepped foot in the city until 1826. What an interesting read about a very exotic place. I learned among other things that one possible meaning of the name Timbuktu is ”a place. covered by small dynes”. Makes me imagine how it looks like there! Fantastic project. I learned many things about Timbuktu, but the most impressive for me, being a book fiend, was that Timbuktu housed more than 700,000 manuscripts, forming a priceless written record of African history. Before and during the occupation of the city by Islamic militants, more than 300,000 Timbuktu manuscripts from the Ahmed Baba Institute and from private libraries were saved and moved to more secure locations in Mali. Timbuktu can be reached by car, boat, or plane. I think I'd choose boat—it may take three days to reach Timbuktu, but it definitely sounds like the journey will be worth it. A World UNESCO site is always a treat to experience! And now we learned a lot of interesting things. For example, that the population of Timbuktu is less than 60 thousand people, and in our the city Tyumen - more than 700 thousand. We learned about the hot climate, about the salt trade, about the fact that rice is grown in Timbuktu! And many more interesting things. We would very much like to receive a postcard from Timbuktu! One fact we rarely know is that Timbuktu was Hub of Knowledge in Islamic World (except Spain) after the Baghdad's fall - fueled by Musa Mansa's wealth, it had rose to such an academic heights that In the early 1400s, a scholar of fiqh from the Hijaz, ‘Abd al-Rahman al-Tamimi, traveled to Timbuktu only to realize that the level of scholarship was so high there that he would have to go to Fez first to take prerequisite courses before he could study with Mali’s scholars. I learned that the main language spoken in Timbuktu is Koyra Chiini, although French is the official language in Mali. I have known about the project Postcards of Timbuktu before. I ordered a card from them a while ago and received it without problems. I was fascinated to read in an article that the project is the only reason for the post office in Timbuktu to open. It's great if it can help people to earn a living. While visiting the Sahara desert I have met a camel man who told me that before he was a tourist guide he lived the usual nomad life, exchanging goods all over the desert. Once they travelled to Timbuktu on their camels. He also introduced me to the music of Tinariwen a band famous for their style: Sahara Blues. I had the luck to see them performing live in London. Thats a great idea. The fact I learned: Timbuktu started as a summer encampment for nomadic tribes of the region. I had never heard about this place before so literally I have learned many facts, but the one that has shocked me the most is the high temperatures during all year because it has to be really hard for its population. This is a really great project and I would really love to receive a postcard from Timbuktu. More than 10 years ago I studied Social Sciences with special focus on Africa and Africanistics as a minor subject so I love a lot of African things (books, music, FOOD!...). I learned that there are up to 60 private libraries in Timbuktu which I find especially interesting because nowadays I am studying Library and Information Sciences. Wonderful project! :) The fact I learned about Timbuktu: The city was a major centre for Islamic learning between the 13th and 17th centuries. Because I live in Africa, and often write about my daily life, I named my Wordpress blog despatchesfromtimbuktu.wordpress.com . I'd love to receive a card from Timbuktu! What a fantastic way to help out an area in need of a helping hand. Fact :"Dutch writer Carry Slee , childrens books. Wrote a book See you in Tumbuktu." One fact I have learned about Timbuktu is that this city has an airport ,called Timbuktu Airport with just one runway which is paved and extends 6,923 feet. Whata a brilliant project. Do they know that we (in any case in the Netherlands) use their city name in a saying when speaking about e.g. someone who left without notice and probably far far away: he went to Timbuktu? Timbuktu has some badass librarians that were able to save a bunch of priceless manuscripts and things during their war. There's a book about them....'the badass librarians of timbuktu', worth a read. I learned that Timbuktu has three of the oldest mosques in Western Africa and that Arabic was widely spoken there, introduced together with the Islam. I'm learning Arabic, so the fact was interesting for me. I also think it is interesting that according to the 2006 survey of 150 young Britons, 34% of them did not believe the town existed. If the project can tell people about this place and help its inhabitants earn a living, I find the project very useful. The climate there is very dry and hot with an avarage temperature of 28°C. That means summertime for the whole year! For me that will be too hot. Timbuktu once hosted the largest university in the world, known as the University of Sankoré. I did not know that Timbuktu was suffering from desertification. And I had no idea it was so hot all the time. Or that Al Qaeda was such a dire problem. Or that it had so many UNESCO sites. I hope Timbuktu can find healing and relief. I learned that Timbuktu has once been a part of the french colony. Thank you for informing about the situation and project. I love that postcrossing opens my mind a bit more every time! Fascinating how Timbuktu was at one point a very important part of trade routes. I'm also interested in how different languages represent place names, in this case, how the French speakers refer to this location as Tombouctou. Timbuktu has a hot desert climate and the temperatures rarely drop below 30 C (86 F). That's something! The hottest record temperatures are almost as high as 50 C (122 F)! I learned that Timbuktu lies directly at the Sahara desert. Didn't know that, although I knew that I have a fascinating history and were a big trade centre in mediaval times. Great project! Did you know that each year there is a 3 day festival nearby timbuktu called Essakane Desert Festival. With art, music, dance, but also camel racing and sword fighting. As a librarian, I knew that the history of libraries and manuscripts reaches far back into Timbuktu's past. Timbuktu's main library, officially called the Ahmed Baba Institute of Higher Islamic Studies and Research, is a treasure house containing more than 20,000 manuscripts covering centuries of Mali's history. I learned that (as other Postcrossers also mentioned) the Ahmed Baba Institute, a center that houses and preserves a large collection of historical Arabic and African manuscripts, is located in Timbuktu. Sadly, the article reported that it is often closed due to lack of funds. Es macht mich traurig, dass diese wunderbare Stadt jetzt so verarmt ist! 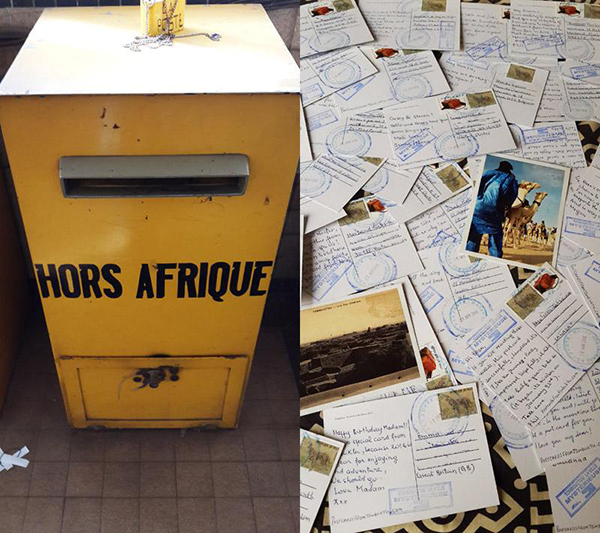 This is a really great project and I really would love to receive a postcard from Timbuktu! I've heard about Timbuktu (or Tombouctou in French) since I was a child as my grand-parents were in Africa for more than 30 years. I always was (and still am) fascinated by the Camel Parade at the "Festival au Désert". Even more fascinating are the "blue people". The Tuaregs have been called so for the indigo-dye coloured clothes they traditionally wear and which stains their skin. This type of initiative is very simple for any of us but very important for anyone who has suffered as much as them. Sadly I met Timbuktu on the TV news for the war. Hi, I love to read about Timbuktu. I the past I had a pen-pal, his name was Bonko, I adopted him through a system (back in the Netherlands, I live now in Canada) and we wrote letters to each other for 5 years. Great Project! I've read that Timbuktu has been a center of trans-Saharan trade for centuries. Timbuktu was also a religious city. According to a West African proverb: 'Salt comes from the north, gold from the south and silver from the country of the white men, but the word of God and the treasures of wisdom are only to be found in Timbuktu.' There is a local legend that the city is guarded by 333 renowned saints as well as numerous lesser ones, and surrounding Timbuktu like a rampart are the chapels where the saints are buried. Loved learning about the name of Timbuktu. 4 different thoughts on what the name means. I bet the locals could tell some fascinating stories of what they think about the name, I always thought it just a name of a place very far away. It is a LONG way from me in Oklahoma but it is cool to find out more about its history. I will continue to refer to it as a place on the other side of the world. 5780 miles is a long way!! Postcards are a great way to help connect people and even help the very poor of others nations, like Timbuktu, to gain an income. Postcards are a great invention, and I do hope the people of Africa send more postcards out if they can. It is a wonderful continent to learn about and see on postcards. I've learnt e.g. that Timbuktu’s Djinguereber mosque was built almost entirely from banco mud. Loved learning about postcards from Timbuktu and learning about Timbuktu itself. Abdel Kader Haidara, a librarian, organized to have 350,000 medieval manuscripts smuggled out of Timbuktu for safekeeping. “Progress”. The two-sided sword. This could be compared to what WalMart has done to small towns in The US. So awesome to know more about Mali and its historical destination Timbuktu. Learning that Mali has been in difficult situations really makes my heart sink. Fortunately, postcards become a trend and help their unemployed tourist guides make a living. Support! I just did some research on the famous playwright Massa Makan Diabaté who came from Timbuktu!! Wow, I didn’t know this was a real place. It is an important trade center for things like salt, sugar and beads. I’d love to get a card from there! Thanks Postcrossing for challenging us to learn something new! Interesting project!! !, another way of knowing different realities! Tempe, Arizona is the twin city of Timbuktu! Who knew! Sankore University in Timbuktu houses many ancient manuscripts. Wouldn't that make a marvelous adventure!? I would love to know more about how tbe salt is produced. I did not know about the war and poverty in Timbuktu. Thanks for sharing this story. This is my first time to hear about Timbuktu. It's amazing to know that Timbuktu is an UNESCO World Heritage Site!! I didn't know about the Floating Rice before.My dad is a rice farmer in California, but this is completely different! Fact I learned about Timbuktu: In the 12th Century it founded its university, making it one of the oldest universities in the world and once had 25,000 students in a city of 100,000 people. Such an amazing project! Thank you for sharing and educating. For some people, when you say 'Timbuktu' it is like the end of the world, but that is not true. I am from Timbuktu, and I can tell you that we are right at the heart of the world." so happy to help with this project. Thank you for sharing this story. I will be happy to support the project and earn much needed income for these young people. This is a great project to help the unemployed find a new means of income. I learned that Tempe, AZ is a sister city to Timbuktu. By dint of discovering fascinating history of Timbuktu I can recommend reading the groundbreaking case of "The Prosecutor v. Ahmad Al Faqi Al Mahdi” (https://www.icc-cpi.int/CourtRecords/CR2016_07244.PDF). The harvesting of the rice that's cultivated depends a lot on the floods. Most of it is eaten by the families who cultivate and harvest it. It's amazing that in the early 14th century AD, the Sankoré mosque, also known as the University of Sankoré, was one of the first universities ever built in the world! Together with three other madrasas("madrasa" is the Arabic word for any type of educational institution), it facilitated 25,000 students, making it also the largest university in the world at the time! The most fascinating part of what I read is just how little archeologically is known about the original inhabitants, as studying the city itself is daunting because of the sand, climate and current political situation. I am obsessed with ancient history and I salivate thinking of all that is buried beneath and what could be learned from it. Спасибо, что поделились этой историей. Lost in the sands of the Sahara, the city of Timbuktu is known all over the world as one of the largest cultural and historical centers of Africa. It is called "the city of three hundred and thirty-three saints", "the pearl of the medieval Mali", "queen of the desert". The medieval Arab geographer Ibn Khaldun referred to Timbuktu as a "harbor in the desert", European merchants - "the city of gold"...Very interesting place! Timbuktu is an ancient city in Mali and sits near the Niger River on the edge of the Sahara Desert. Timbuktu was also an important center for trade. Caravans of tradesmen traveling by camel stopped in Timbuktu to get water and food as they traveled. During World War II Timbuktu was used to house prisoners of war. Today, Timbuktu is an UNESCO World Heritage Site. I learned so much about this mysterious and fascinating city. I did not even know where it was in Africa but now I know it is part of Mali and a victim of desertification which has affected its economy drastically. I loved reading about its Golden Age of trade and scholarship and the contributions it made to the world of religion and education. Thank you for sharing this topic. "According to one tradition, Timbuktu was named for an old woman left to oversee the camp while the Tuareg roamed the Sahara. Her name (variously given as Tomboutou, Timbuktu, or Buctoo) meant “mother with a large navel,” possibly describing an umbilical hernia or other such physical malady." It was intriguing to read more information about a legendary place like this. THANK YOU Postcrossing for always sharing such interesting postcard connections. Timbuktu is a hot desert climate like where I live. Arizona’s hottest months are June, July and August while their months are April, May and June. I can so relate to their 104 temperatures. Today’s high was 102! Sidi Yahya mosque has a sacred door leading to the tomb of saints. It was believed that opening the door would bring misfortune or even end of the world. Ansar Dine group destroyed the door in 2012, but it was restored in 2016. Hopefully Timbuktu will see better days once again. Wonderful!!! It would be great to get a postcard from such a wonderful country!!!! I envy the lucky ones who get the cards!!! Thank you for a very interesting article on the far away nation of Mali. I have known of this country for many years since I have been a stamp collector for over 60 years now. It would be a joy to receive a postcard from Timbuktu and, in a real way, to connect with this isolated yet beautiful place in Africa. Best wishes always, "MrBill" in the USA state of Virginia. In my school days, when we would sing hymns at morning assembly it was not unknown for the following verse to be substituted when singing "Praise the Lord ye heavens adore him"
Coat and bands and hymn-book too. Words came to my mind on hearing the name Timbuktu or Tombouktou include: desert, Niger river, Mali, Ghana Empire, Madrasahs and trade of gold and ivory. I just learned that even during the coldest month in a year (December, January and February) the average temperature in Timbuktu doesn't drop lower than 30 C! It would be priceless to receive one day a postcard from this place! I have learned that postage in Mali is very expensive. I would love to receive one of the postcards. Timbuktu, also spelled Tombouctou, région, northern Mali, West Africa, bordering Mauritania on the northwest, Algeria on the northeast, and the régions of Gao on the east and Mopti and Ségou on the south. Timbuktu région was created in 1977 from the western part of Gao région. It is entirely within the Sahara (desert) except for the extreme southern area along the Niger River. It consists of relatively flat sandy or stony plains with elevations of about 1,000 feet (300 metres). Salt is mined in the north at Taoudenni and is transported by camel caravan south to the town of Timbuktu, the région capital. The principal irrigated crops grown in the Niger River valley are corn (maize) and rice. Population groups in the région include the nomadic Tuaregs and Moors in the Sahara and Songhai and Fulani peoples in the irrigated valley. Я знала, что в Тимбукту сейчас не лучшее время, но далеко не так, как я представляла. In its Golden Age, the town's numerous Islamic scholars and extensive trading network made possible an important book trade: together with the campuses of the Sankore Madrasah, an Islamic university, this established Timbuktu as a scholarly centre in Africa. Reading the story behind the project is amazing, and it makes me have hope for the mankind to fund such a project to help raise, even a little, living condition of the people in those places. I fully support this project! I am quite ashamed to say that I am not that familiar with the place of Timbuktu, though I heard about it but never really understand it (if you know what I mean). This blog is really motivating and knowledgeable! Thanks for sharing, now I just know about Timbuktu which also has World Heritage Site. I read first about Timbuktu from Donald Duck magazine about 30years ago ... always wondering why Donald went there to run away. Wondering that Timbuktu is really exist or no. With this project I finally know that Timbuktu is really exist. Hope that this project will goes well. Thank you for featuring Timbuktu. It is an interesting site. I learned that Timbuktu,Timbuktu Cercle, Mali, is a UNESCO World Heritage Site, and since 2012 it is on the List of World Heritage in Danger. Wow. this is awesome. Timbuktu exists ..yay!!! I learnt that Timbuktu (does indeed exist) is an ancient city in Mali, currently having a population of ~55,000 people. On the historical front, trade flourished in Salt, Gold, Ivory & Slaves! Timbuktu is ancient city in Mali, I hope can vist it. YourI think the race of the Paris Dakar rally passes through this city, or very close. Honestly, this is the first time I know about Timbuktu. Then Wiki told me that this place is famous for its Islamic architectural style of mosques, and Timbuktu was as well as Cairo, Baghdad and Damascus, was one of the famous Islamic academic studies. I didn't know very much about Timbuktu before now, but I always heard that it was often decanted like a mythical place. Its true or alleged existence was discussed in Europe since 1805, when a scottish explorer named Mungo Park managed to reach it for the first time but never returned further back (according to a later testimony by Renè Caillié). It is a pity that a city that has so many beautiful corners to see is closed to the rest of the world because of certain people who defend their ideals with violence. That's how they show they're not interested in their people. I hope that soon this situation will be just a news story that happened and that this territory will flourish again and at the same time I will be able to get to know it, even if it is through an image reflected on a postcard. Awesome project. Heard of Timbuktu before, being in the past a famous center for trading and education in the past. More recent news of Timbuktu (and Mali in general) are not so good, except for the one on how the local people hide and saved priceless old manuscripts and books from destruction when the city was under attack a few years ago. I am surprised to read and absolutely supporting this kind of project to help people make their daily living. I just learned about Leo Africanus and his influence on the western view on Africa. I didn't know that most of what european people said to know for several decades was mostly coming from one man. Thinking of it, I am not surprised that people thought of Timbuktu having gold-paved streets. This is such a lovely project! I hope I can be part of it one way or another. I’ve spent an hour or so doing some research and it’s interesting that it’s also called the city of the 333 saints as 333 saints were laid to rest there. The more you know! Rice is the main crop in Timbuktu which is weird given it seems like it's in the desert and rice needs lots of water. :) Great project!!! @CamJP: The Niger river near Timbuktu has seasonal floodings, much like the Nile in Egypt, hence rice can be grown there. Nice project! I have read a book named Timbuktu by Paul Auster. It was a mythical place. I had heard of Timbuktu. I heard my grandparents and their generation use the phrase "from here to Timbuktu". I knew it was in Africa but that's about it. I'm surprised there are as many as 54 000 people living there. Great idea for a project. I've ordered my postcard. Wow, awesome! Hearing from such small ideas and things that realy can change something in this world fill my heart with joy!!! Thank you for organising this give away. Who wouldn't love to receive a card from Timbuktu. I was very interested to read about the salt trade and about these wonderful guys and their postcard project! Timbuktu was once the intellectual capital of the continent, and a centre of scholastic activity. In its golden age, around the 15-16th Century, Islamic intellectuals would flock to Timbuktu, viewing the area as a useful platform for them to propagate Islam throughout Africa. Today, one can imagine what it was like back then by admiring the prestigious Koranic Sankore University and the city’s impressive mosques. Ultimately, Timbuktu still holds the key to discovering Africa’s intellectual history. The wealth and very existence of Timbuktu depended on its position as the southern terminus of an important trans-Saharan trade route. Taoudenni is a remote salt mining center in the desert region of northern Mali, 664 km (413 mi) north of Timbuktu. The salt is dug by hand from the bed of an ancient salt lake, cut into slabs, and transported either by truck or by camel to Timbuktu. The camel caravans (azalai) from Taoudenni are some of the last that still operate in the Sahara Desert. I found these facts about salt being transported by camels really interesting. And that a place could be wealthy from salt mining. Would be wonderful to receive a postcard from Timbuktu. What an amazing project. I learned that Timbuktu is located on the southern edge of the Sahara Desert, 15 km north of the main channel of the River Niger. Only thru Postcrossing would I have known about this, keep up the great work Postcrossing! I know Timbuktu was a world centre of Islamic learning from the 13th to the 17th century. I learned that Timbuktu is located on the southern edge of the Sahara 15 km (9 mi) north of the main channel of the River Niger. The town is surrounded by sand dunes and the streets are covered in sad . I knew this project, but had ne v er ordered a postcard. Maybe for a friend's birthday... that would be a great surprise! I know isn't the best film in the world, but Timbuktu always makes me think of "París Tombuctú"! I hope can get postcard from Timbuktu, the place that I know from Tintin comic. The reality is there are many world heritage sites there. I haven't really heard about Timbuktu before, but now I know some absolutely awesome facts connected with the city. One of them is that ancient manuscripts dated back to the XII c. in Math, Biology, Music, Piety, Astronomy, Law and History are some kind of the Timbuktu's pride and are thoroughly stored by local families. Some of them are kept in Europe, some are in private libraries in Timbuktu (BTW, the quantity of libraries in the city is unimaginably - about a hundred!). On my mind the fact is gorgeous and some more research must be done to find all the MSS written in Timbuktu. What a great city/empire, so full of history. Only recently I read that in Mali, being a Marabout could be considered property of a whole clan, rather than a single person. How exciting! I learned that the salt trade is still part of th economy in Timbuktu. I am glad the postcard project allows these young men to earn a living. Sounds like tough times there 😟. I knew that Timbuktu was a real place, but didn't know which country it was in. I would love to receive a card from Timbuktu. I have learned a little bit about how Mali is being affected by desertification. I've learnt that it used to be on the cross of several trans-Saharan caravana routes. I learned that Timbuktu's main language is Koyra Chiini, which only 200,000 of the world's population spoke in 1999. I didn't realize that Timbuktu was right along the Sahara desert and had a desert climate. How interesting to learn about this unique place! The "Festival in the Desert" was an annual concert in Mali, showcasing traditional Tuareg music. From 2010 to 2012 it was held on the outskirts of Timbuktu. The Festival has continued to be postponed due to security concerns in the region. I learned that Timbuktu has ca. 60 libraries that are owned by local families and institutions. I've never been to Africa,only getting information on internet such as "World Heritage". I love this project! I would love to get postcard from Timbuktu. Very interesting history. Watched a documentary on their lost libraries. It was an ancient learning center and there were many ancient documents, going back 8 centuries, hidden over the years for protection. With independence, the families who had hidden the manuscripts have brought them from hiding and many libraries have been established housing them. Bonjour cher personne de tombouctou . Mon papa ma achetais y a des années en arrière la croix d'agadez que je porte assez souvent . Sans savoir que cela venez du mali alors on nous a raconter des tas de choses sur cette magnifique croix . On nous a dit que c etait la croix des kabyles puis des touaregs et puis on a su quelle voulais parler de courage et d amour . Est ce cela ? La croix serais faite a la mains avec des pierre de rocailles ainsi que de l argent brut et fais dans le desert . Je trouve que cous etes des personnes admirable par votre courage votre force physique a la chaleurs que nous arrivons pas a supportée . Wow so sad how war can drastically change the life of people. Most have been a magical place indeed. I learned that Koyra Chiini is the dominant language spoken in Timbuktu. Wonderful story of amazing people doing what they can in an extremely difficult situation. When we clicked on the link to learn about Timbuktu, we were drawn to the story about Abdel Kader Haidara, a librarian in Timbuktu who worked to smuggle 350,000 medieval manuscripts out of Timbuktu for safekeeping. Just another example confirming that librarians are the best people. I learned that Timbuktu is located at the southern egse of the Sahara. Postcrossing is a great idea how the little postcard can enhance the domestic economy. Timbuktu is one of the example on how postcrosing are connecting the world by crossing the borders and having a little perspective on how others are living. On year i was born, In the 1980s, accommodation for the small number of tourists was provided by two small hotels: Hotel Bouctou and Hotel Azalaï. Over the following decades the tourist numbers increased so that by 2006 there were seven small hotels and guest house. I wouldn't have imagined that 2 hotels were enough to accommodate all tourists - even back in the 80s! I went to the link and learned that Timbuktu has hot desert climate...so this is the fact I learned and wanna point out because(please don`t laugh at me) as a child when hearing someone mention the Timbuktu-sayings, I always somehow imagined it to be a very cold icy spot on this earth;o)!!! I`d be thrilled to find a card from that special place in my mailbox:o)! Music of the Sahara is populair among lovers of the so called WorldMusic, I am one of them. Such an interesting project! I learnt more about Timbuktu through my children's school work, all about the great Mansa Musa and his travels. How he travelled to Mecca and back and his influence in the growth of the Mali Empire. It is sad to think what a big centre of learning Timbuktu was, and how it is today. I lived near Tempe, AZ years ago (which I learned was one of Timbuktu's "sister cities") and remember how a dry river bed near Tempe would flood during the monsoon season there, much as flooding occurs in the Timbuktu region during the annual flood of the Niger. I was also surprised to learn about Timbuktu's inclusion in the List of World Heritage in Danger. I probably would never have learned anything more interesting today if it weren't for the Postcrossing Blog. There is a very famous mosque in Timbuktu - I think it is featured in Michael Palin's Sahara TV programme, which I watched years ago. It was once a city well known for selling salt, slaves, and gold. So I like this project! I learned that in medieval times caravans would meet there to trade salt for gold and ivory. Wonderful project! A new page in the geography of Postcrossing! But how informative participants' comments! Very valuable information turned out as the result of discussion. Good luck to all participants! I will tell about this project people as much as I can. What I just learned about Timbuktu is that right now it's rainy season there. There's no rain from Oktober to May. In June, there's a chance of rain, but only little, and in August there are 6 days of rain on the whole, but it's only 64mm in the whole month. In comparison: While Timbuktu has only 18 days of rain in the year, Bremen (Germany) has 126! I had no idea that a language called Koyra Chiini even existed, but apparently it is the language spoken in Timbuktu! Great project! I fondly remember the 2014 film Timbuktu, it had such an impact on me. First of all, I learned that T is in Mali! I didn't know that, and my husband and I sponsor a child who lives in Mali. And on the map, the spelling used is Tombouctou! I've learned that the city is now essentially the home to the Kel Tamasheq, Songhay and Arabs. These are the main ethnic groups who are the original settlers of Timbuktu. In english dictionaries Timbuktu is described not only as a town in Mali but also as any faraway place! According to Wikipedia, in the imagination of Europeans and North Americans, Timbuktu is a place that bears with it a sense of mystery: a 2006 survey of 150 young Britons found 34% did not believe the town existed, while the other 66% considered it "a mythical place. 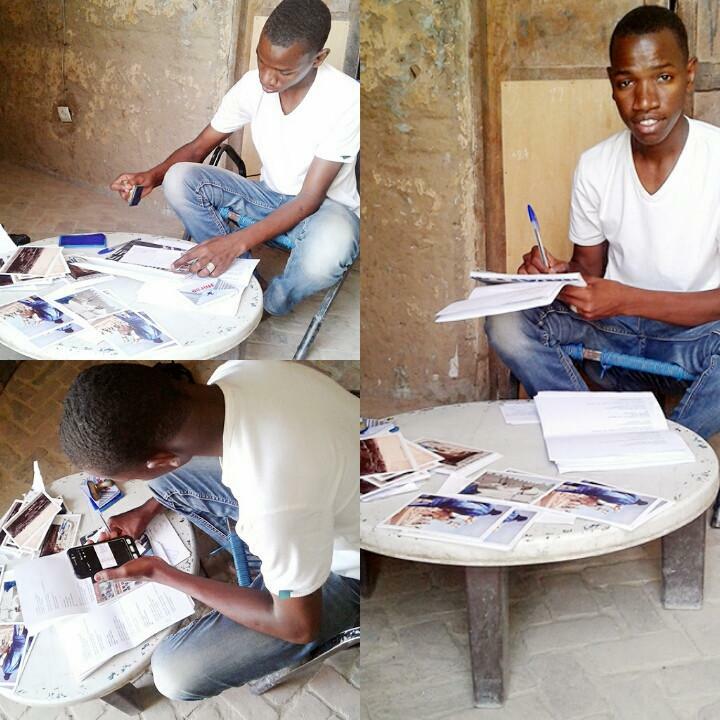 The project is just great, and I hope that many many postcards will travel from Timbuktu around the world! Timbuktu’s golden age was the 13 - 14th centuries. Science, arts and religion were taught. I know the musician Ali Farka Touré since lots of years and I like his music. I knew he is from Mali, but today I learned that he is from Timbuktu. I learned that in Mali, near Timbuktu, was born one of the earliest universities in the world ! I learned Timbuktu is in Mali, but not it's capital. Timbuktu has got five sister towns. Unfortunately, I googled "cats in Timbuktu" to find out a fact, perhaps, about local cats that I could add here. I did find something out that made me really sad (and that I will not repeat here!). It makes me hope this project will help sad little boys find interest in something worthwhile like sending postcards! The war is terrible. I hope that in the near future in Timbuktu tranquility and peace will reign. This is an amazing project to help people learn more about the area and helping the local community as well. It's sad to hear about the declining tourism. I also read about Festival au Désert--a festival with music that moved to the outskirts of Timbuktu and had to end in 2012 due to security issues. I do hope that one day they are able to hold the festival again as music truly is something that is universal and breaks all language barriers. A simple song can bring happiness or bring people together. I know that the Sankoré Mosque is an UNESCO World Heritage Site. When I was a child I thought Timbuktu would be a place in a fairy tale. I think this project is great. Last week my daughter was reading a Dr Seuss book that she just got and came asking about Timbuktu and Constantinople. I told her that Constantinople was where Istanbul is now but Timbuktu could be a made up place by the author because Dr Seuss has lots of made up things on his books. I was reading "Life of Pi" two days later and Timbuktu was mentioned in that book too. I didn't look it up but marked the page to show her, which I haven't done yet. Today, one week later, there is Timbuktu in postcrossing. In 10 days I have heard of something that I didn't know existed 3 times. My fact about Timbuktu is that French is Mali's official language, today the large majority of Timbuktu's inhabitants speaks Koyra Chiini, a Songhay language that also functions as the lingua franca. I really didn't know that French is the official language. An interesting fact. I just started post crossing so how great would if be to receive one of my first cards from Timbuktu. I can't imagine a more special place to get a card from. In the article they already wrote it's very rare to get a card from over there. Very sad to read that Mali/Timbuktu is back on the World Heritage Danger list because Ansar Dine group has destroyed historical sites and vows to destroy more - 13 in all. Heartbreaking that so much history that has stood for centuries can be lost so quickly by such a small group of people. Awesome :) thanks for sharing! I spent a while learning about Timbuktu, and found lots of interesting info! For example, Timbuktu has been on the UNESCO World Heritage List since 1988! I knew about city only from song - that it`s a sunny place. Now I understand that the city has UNESCO heritage World Heritage Sites and the cityzens have many problems but do everything they can to save thre turist attractions. The project is a great idea to tell the World about Timbuktu. I believe that all problems of the city will be solved and more turist all over the World will visit Timbuktu. A fact about Timbuktu: Most of Timbuktu's inhabitants speaks Koyra Chiini, a Songhay language that also functions as a lingua franca (= a regional language that connects people with different native tongues, similar to for example German in Central and Eastern Europe). Koyra Chiini is a Songhay language and belongs to the Sudanese language family. Mali's official language is French, but 40 other languages are spoken in the country. The Sankoré mosque, also known as the University of Sankoré, was one of the first universities ever built in the world and for centuries, Timbuktu has been home to one of the largest collections of ancient Islamic manuscripts. I can not believe hot it is! May is 108f/42.2c in the day and 78.8f/26c in the night. I am assuming that they have no air conditioning units? I've learned that Timbuktu hosts thousands of manuscripts--enough to fill several libraries! I wasn't aware that Timbuktu was located in Mali and that the spelling of the name has changed many times. Interesting! Thank you for informing us about this great project. I‘ve spent the last 90 minutes or so checking facts about Timbuktu. Its history is so rich and eclectic, but I‘m sad to find out that it‘s been struggling for so long now. I knew Timbuktu was a real place and that it‘s somewhere in Africa (I feel pretty ignorant now! ), but I‘m really curious and eager to learn more. Several historical sites in the city were declared part of the UNESCO World Heritage in 1988. The first attempt to get the whole city on the list in 1979 failed. Sadly, the sites have been on and off the list of World Heritage in Danger ever since, which shows how hard and dangerous life in this place must be. Another interesting fact: The first European ever to reach Timbuktu was Alexander Gordon Laing. He arrived there in 1826 after having crossed the Sahara from north to south and was strangled by Tuareg shortly after. I hope Postcards from Timbuktu will find lots of supporters! Wow! What an awesome project to start in your community and to involve so many individuals. I love it! And I would LOVE to receive a postcard from Timbuktu! It's a great project!maybe it can help someone like that ..
Qué más se puede decir? Los compañeros han puestos cientos de datos que me ha sido muy grato conocer. Tengo poco más que aportar, pero sí existe una curiosidad que quiero compartir, Berlanga, director de cine español, hizo en 1999 una película llamada “Paris - Tombuctú “, la han visto? Muchas gracias por darnos a conocer proyectos tan bonitos como este y poder tener la ilusión de ser uno de los agraciados con una de esas cinco postales, espero tener suerte, mil gracias. I love the idea of this project. Would love to see it in many other struggling communities. Today I learned that the first European to visit Timbuktu was a Scot. wow, what a fascinating story. Thanks for sharing it! Did you know there is a town of Timbuktu in America? It’s in the state of Michigan! What an awesome project! I would love to receive one of their cards. I never realized that Timbuktu is an actual place, but now that I've learned that little fact, I'll be doing more research for sure. It’s a very beautiful project! I love this project and the fact that postcards can make such a difference - bring joy and support people. Timbuktu has had a permanent settlement since the 10th century and hopefully it regains strength. Under the Songhai empire, the city became a great Muslim educational center, with more than 180 Quranic schools and universities. By the end of Mansa Musa’s reign (early 14th century A.D.), the Sankoré mosque, also known as the University of Sankoré, was one of the first universities ever built in the world. A contemporary of Oxford and the Sorbonne, the level of learning at Timbuktu’s Sankoré University was superior to that of all other Islamic centers in the world. The three madrasahs — Djinguereber, Sidi Yahya and Sankore — facilitated 25,000 students, making it also the largest university in the world at the time. This is a great project! As a student of history, I think it's very interesting that Timbuktu was a medieval trade center. European medieval trade centers generally continue to benefit from that historic status (through city development and economic activity). I'm interested to learn more about what exactly happened in Timbuktu's history that caused it, despite its apparent strategic location, to turn out so differently. I didn't even know it was a real place. I would not have guessed it was in Africa. I think the old buildings look really cool. It looks like it would be a fun place to explore. It's an ancient city in Mali, situated 20 km north of the Niger River. While it is politically unstable at the moment, it used to be a major city with a golden age in the 15th and 16th centuries. Then people came to the city for scholarship of religions, arts, math and sciences for its 100,000 inhabitants and the world. What a great project! Timbuktu is home to University of Sankoré, which was one of the first universities every built in the world! This is an awesome project. I would like to hear more on how I can contribute. I also find it interesting the French is the official language with some others sprinkled in including Arabic. I also think it's fabulous that Timbuktu is a real place and definitely would be an interesting place to visit! Phil, Bintou and Ali, well done for showing your part of the world to us. As a child (now 67 yrs old) we used to use the expression "to go to Timbuktu and back" to denote far away. I learnt at an early age that Timbuktu was in Africa. It sounded exotic. I would love a postcard or two from you. Tempe, AZ is a sister city. Very cool! Timbuktu has a hot, desert climate. Timbuktu is located on the southern edge of the Sahara 15 km (9 mi) north of the main channel of the River Niger.... I want to receive a postcard from Timbuktu!!!! I have learned that Timbuktu was a regional trade centre in medieval times, where caravans met to exchange salt from the Sahara Desert for gold, ivory, and slaves from the Sahel, which could be reached via the nearby Niger River. I knew the word 'Timbuktu' for the first time since I read the novel and then I searched for information through the internet. What I see, Timbuktu has a unique building between its territory which consists of desert and looks exotic. I learned so much about this intriguing city in only a day! Thank you Postcrossing ;D If only I had a time machine to see how Timbuktu functioned when it was the world centre of Islamic learning! So many interesting facts! Thank you for bringing Timbuctoo to the fore, Postcrossing crew, it's so necessary to stop and think outside our comfort zone and see what other countries are going through. My fact about Timbuctoo is how I first learned about this city, which was through Alfred Lord Tennyson's poem "Timbuctoo". In it, the city is described as a fantastic glowing city, a magical land. It continues to be so and it is seen in actions such as the one recorded in this article (https://www.theguardian.com/world/2018/jan/18/timbuktu-begins-to-sing-again-mali-music-jihadists) from January this year - people getting together and singing through adversity and turmoil. Hats off to them and to the humanity that still permeates our actions! Timbuktu - glorious city with the golden past and dark present, but with limitless dreams about bright future, based on its historical meaning. Tumbuktu for me was only a film from Abderrahmane Sissako, now thanks to you and wikipedia i learn more about this country ! It is one of the cities of Africa the name of which is the more loaded of history,. I got sort of sidetracked when reading about Timbuktu and ended up reading all about its university Sankore, it was huge and considered among the best when first built - It was based around 3 mosques one of which is that strange almost pyramidal structure with the logs sticking out is on all the photos. Which was built in 989CE!! The walls are made of mud and need patching up every year. I hope it becomes safe to visit again - it would be a once in a lifetime bucket list moment! I had always heard about Timbuktu, but learned more about it when a friend's father stayed there for a bit (in the 1980s). I learnt that the German Africa-Explorer Heinrich Barth was welcomed there in 1853 as he made many friends there, also among the Tuareg. He had many talks with the Quran scholar Ahmad al-Baqqai about Christianity and Islam. Heinrich Barth drew many maps of the Sahara and Sahel-zone, describing the traditions and cultures of the people without prejudice. I would absolutely love to receive a card from there after I've learnt so much. But I definitely will support the project apart from the giveaway here in the blog. Only about in December and January this is a port city - very interesting. Two things that I learned was: it's in Mali and secondly the city played a large role in being an academic centre for Islamic learning into the 17th century. Very cool stuff and thank you for sharing Phil's project! I got lost in the wikipedia reading all these new facts about Timbuktu and something I learnt was that Timbuktu is on the list of world heritage in danger. Makes me worried that such an ancient city is in danger of getting destroyed. What an amazing project really! Thank you so much! I wish Turkish lira didn’t hit record low and lost all its value against the USD so I could afford it too. I know pretty much about Mali and Timbuktu. I have always been interested in Mali and neighbouring countries. An interesting fact that the majority of Timbuktu inhabitants speaks Koyra Chiini language. I had also watched a documentary of BBC where they showed the historical mosques of Djenne and Sankore, both in Mali. Thank you! Timbuktu is the twin city of Kairouan in Tunisia, which I visited many years ago. I didn´t know that Timbuktu is in Mali! When I was a child I read a book by Werner Legere about Rene Caillies journeys to find Timbuktu. Difficult conditions that time. But he discovered it in April 1828 as the first European. Hi! This is a wonderful project! It's a great joy to receive such a postcard! I learned about your wonderful city, before I heard only the name, but did not know anything about it. I also found out that the Djinguereber Mosque was built in 1327, the oldest building in West Africa. It is said that this building inspired the Spanish architect Gaudi. I wish good luck for unemployed guides, and for this wonderful city! In it's golden age, Timbuktu was not only a trade centre, but also a scholarly centre with an impressive library. Years ago -- many years! -- when I was in the Peace Corps in Burkina Faso (then called Upper Volta) several of us had the experience of driving from Burkina up through the desert and into Mali, eventually arriving at Timbuktu. It makes me sad that terrorism now makes this whole region unsafe. :( -- From reading about it I learned how much I miss West Africa...the culture, the people, the food, everything. I also was reminded of details about the Sankore mosque which I had forgotten. with its rich cultue and its hard-working people ,culture self-confidence and, of course,support ,kindness and love from all over the word ,its future can become better and better.For more ,the earth is becoming better and better. As a saying goes ,"One tree doesn‘t make a forest",everyone‘effort DOES count ! Wow! What an interesting place is Timbuktu. Thank you Postcrossing for sharing it with us. Sankoré mosque of Timbuktu, also known as the University of Sankoré, was one of the first universities ever built in the world. At that time it was the largest University of the world. Isn't it amazing? Timbuktu was an education center for Africa. I find that very interesting. Timbuktu used to be a hub of Arab-African trade in the 16th century and often descibed as an ancient city of gold. But those were the days and Timbuktu is now suffering the effects of desertification, poor governance and graft. I am glad to learn something new today and I hope to receive a postcard from Timbuktu! The fact I learned about Timbuktu is that the main crop grown is rice. In the 1970 Disney animated feature "The Aristocats", Edgar, the villain of the story, threatens the cats with being sent to Timbuktu! Thank you so much for this giveaway. FACT: Timbuktu was settled in the 5th century BC. Amazing idea, it would be fantastic to get a postcard from Timbuktu! In December 1988, the World Heritage Committee (WHC) selected parts of Timbuktu's historic centre for inscription on its World Heritage list! And I even didn't know where in the world it was... Thanks guys. Timbuktu used to be a very wealthy city... It wsa not until trans-Atlantic sailing routes started to develop that the city began to decline. In its early days, salt, gold, and books were the main commodities traded in Timbuktu. I knew that Timbuktu exist but I didn´t know that it´s in Mali. What a coincidence I found it today in a stock magazine (börse-online) of a friend: an article about the richest man ever, not Bill Gates or Rockefeller , but : Mansa Musa. Mansa Musa´s fortune was equivalent to 400 billion dollar (400 Milliarden Dollar) When Musa died in 1337, Mali was the second biggest empire on earth. Wow, what a knowledge about Timbuktu! To much to read actually. I saw a very special movie that is called "Bamako". It is about Africans that start a open-air-trial in this city against the worldbank and IMF, mixed wich all day happenings around. A movie that goes right into the heart. timbaktu in telugu one of the languages in india means - “Sarihaddu Rekha” or the last horizon where the Earth meets the sky. During Timbuktu's golden age its books and manuscripts were a most valuable commodity, with scholars visiting from the rest of the Islamic world to study them. Timbuktu housed more than 700,000 manuscripts, forming a priceless written record of African history. Best wishes to the postcard business; I hope it makes a difference for a number of people. Being a Medieval city, Timbuktu was a hub for trade; gold, ivory and slaves for salt from the Sahara region. I have a dream to travel to Africa and would love to see the results of this project flourish and provide help for much needed Timbuktu residents. One of the rarest country card to receive.. Fingers crossed.. It can turn a flourished city into a mythical one, can dug a city's desertian grave. Wow corruption can do wonders. It's really sad that such a beautiful city is now turning into a desert day by day, all thanks to its corruption. Timbuktu was the cultural centre of the Mali Empire! I am from Bulgaria and there is a book, called " The island of Tambuktu" edited here. The second letter of the name is "A" and it was changed intentionally by the author. It is a story , written by Marko Marchevski and was my favourite school novel - about a fictional island during the second world war and the main hero - Anton ( like Robinson Crusoe) living with the natives on the island. As a child I was afraid from the tribal priest Arriki and his diary with white sheets. At the end of the novel all the readers discovered that it was the ship diary of Ferdinand Magellan and the priest used the diary for predicting the future and telling the people if their deeds are right or wrong. I didn't have an idea that their temperatures in Timbuktu can reaches 49ºC! This is a great initiative to help people from Timbuktu and I wish Ali, Bintou and Phil good luck with their project. I think Timbuktu has a very interesting history. It was founded in the 5th century and became an important place, because it's located on a crossroads for trade. The caravans that visited the city brought the first scholars and that's how it became an important centre for Islamic culture with the University of Sankore and many madrassas. Wonderful project! As a kid I heard the expression "as far away at Timbuktu!" Didn't realize it was an actual place, an ancient city in Mali. I heard often as a child, please go to Timbuktu, or where is he gone, he went to Timbuktu, more as a joke. I didn't know it was e real place . Now I never will forget. The main agricultural crop is rice and the success of the crop is partly dependent on floods. Absolutely fascinating to read about this town whose name I first heard in a Disney movie. So rich in history!! I already knew of the real existence of Timbuktu (Tombuctu, in Portuguese). I also know that it is in this city that the famous Ahmed Baba Institute stands, with its collection of 20,000 ancient Arabic manuscripts, which depict more than one millennium of Islamic scientific knowledge. Ps: I know a Brazilian girl named Mali (name given by her mother in honor of this African country). As a historian I affirm how important this is to preserve the history of this mythical place! I know that this city is a world heritage site and that UNESCO has started a program to conserve and protect the city. It was inhabited by Muslims, Christians and Jews for hundreds of years, and has always been a center of religious and racial tolerance. The local cultures - songai, Tuareg and Arabic - mingled, but retained their distinct traditions. I learned that hundreds of thousands of manuscripts were collected by citizens of Timbuktu over several centuries, then hidden in cellars, in walls, or buried. They survived, and a few years ago a librarian managed to have 350,000 medieval manuscripts smuggled out of Timbuktu for safekeeping so they wouldn't be destroyed by rebel forces. This is a society that values learning and scholarship. I learned that Timbuktu was a regional trade centre in medieval times which is really cool. What a fantastic idea! I learned that French is Mali's official language but today the large majority of Timbuktu's inhabitants speaks Koyra Chiini. Timbuktu was a center of Islamic scholarship, home to a 25,000-student university from the 13th to 16th centuries. Sacred Muslim texts were carried great distances to Timbuktu for the use of eminent scholars. The teachings of Islam, from astronomy and mathematics to medicine and law, were collected and produced here in several hundred thousand manuscripts. Quite an impressing history for a faraway city! Timbuktu is not far from the river Niger. Great project, congrats! I've learned that Timbuktu is listed in UNESCO's World Heritage list since 1988 and List of World Heritage in Danger in 2012. It is very sad to read that muslim fundamentalists have destroyed several shrines in the city. I am glad PostCrossing is supporting and publicizing this project! I did not know that Timbukto has been around since the 10th century!! Timbuktu is surrounded by sand dunes and the streets are covered in sand. What a strange place to live (or so it seems to me). I was one of the people that did not believe that Timbuktu existed, until my best friend's dad went there in the 1970's for business and sent her a postcard! He worked for a company that was exploring for oil and that's what took him to that part of the world. As for what I learned today... I had no idea that an area so "poor" had such a rich library & manuscript heritage! Leave it to individuals to make sure the simplest things in life are safeguarded! There is a house Sarah Baraboo...» That was my the first familiarity with this country! Now I will learn more!!!! Old Filipinos would say ..."sa Timbuktu" (meaning: "...from Timbuktu.") whenever asked where something came from and wouldn't say where, really. Young Filipinos thought it's an old saying or a legendary place in Filipino mythology. In the age of the Internet, imagine how many young Filipinos had a surprise of their lives that Timbuktu is actually in Africa. I've heard about Timbuktu and it called the edge of the world. I just learned that Timbuktu has an important history and has some historical sites. 'English dictionaries now cite Timbuktu as a metaphor for any faraway place'. The name 'Timbuktu' sounds magical. I also, been surprised with heritage of library's. Its interesting to me to learn something new. The main language spoken there is Koyra Chiini. I never really knew anything about the place except for its name “Timbuktu” (meaning somewhere far away). I heard about this website before that you can order a postcard from Timbuktu and support unemployed tourist guide, but I was not sure how legitimate it was. Now, after reading that Postcrossing supports it as well, I feel confident to order the postcard from them. I knew that Timbuktu is in Mali, I knew it is in Southern Sahara, but had no idea that it is UNESCO site. This is what I learned by reading today. Thank you. it's a very healthy idea-to support postcrossing around the world! Timbuktu has a great history, and such an opportunity is to remind about such an interesting place, read it's story! A nice initiative! I knew that Timbuktu was in Mali, but I didn't know that it was a great learning center in the 13-17th centuries, as well as its existence was considered a mite until the beginning of '800. HI! I know the name Timbuctu, here it was used to speak of a faraway place in the world! I've learned about Timbuktu that people are very poor and we can help them only with postcards! I want to learn more! Thank you for the share! In a survey, 66% of respondents thought Timbuktu was a “mythical” place and is even considered as Africa’s El dorado. Like many postcrossers before me, I only know Tombouctou as the saying "a faraway, unnreachable place" and never spontaneously searched to learn anything more, such a lack of curiosity, a dull mind. Facts I also learned is that the houses of the "first westerners" are still standing in town (mostly are private homes)The first wheel of the town too is still preserved in Timbuktu Ethnological Museum. Before been know as a faraway exoctic place, Tombouctou was nicknamed The city of Gold because of the description of its wealth by some to Europeans. But the most important fact I learned is that despite is impoverished state, insecurity, harsh climate and living conditions, people here don't give up on their town, their history, their lifes. My thoughts to them. When I was little I had a childrens picture book. It was about a little boy and his family in Timbuktu. I forgot the name of it but I remember the book very well. That is because I loved and hated it at the same time. Loved it because of the beautyful illustrations and hated it because of the sad story. With this book I learned about slavery. The little boys family was captured and sold to cotton farmers in the USA. There they were seperated and brought to many different farms to work there. The little boy and his sister went out to search for their family, but could not find them. All while the slave holders were searching for them. Nice initiative and very interesting, I learned a lot of Timbuktu this way. The most fascinating for me are all those manuscripts that are still there (700 000). I love letters ands scripts, and of course postcards ;-). I am going to buy myself a card on my birthday ! There is not enough rain in Timbuktu for the grain, so they have to use the River Niger to feed the crops of rice. Fun fact: The Madrassa in Timbuktu held over half a million books at its peak! I treasure my odd and single postcards from far away places. I would be excited to win one from Timbuktu. Considering that the monthly income is only $80-$90, what a boom to their economy it would be if even half of us as a group would purchase a post card to be sent to a friend or even have one sent to ourselves. when I was child, all the things about Timbuktu that I know is about fantasy. I read Donald Duck comic lot, and in there, Unca Donald always hide in Timbuktu from many troubles that he made. Haha. But while I was growin' up, I know that Timbuktu is a small town that being a part for Islamic civilization that raises big people as Ibnu Batuta etc. Timbuktu is far, far away and has/ had a wonderful library . I learned about the historic Sankore University in Timbuktu. I read that the students would pay the lecturers in money, clothing, cows, poultry, sheep or services, depending on how well-off the student's family was. Thank you for bringing this postcard business to my attention. This is such a great idea! I definitly have to find someone who will appreciate a card from Timbuktu and send one to them! Thanks for introducing this here! As I like animals I googled what animals can be found in Timbuktu. The Aardvark (Erdferkel in German) is not only very cute, but also has a very charming name :) It eats ants! I learned that Timbuktu has a similar population to my hometown! About 54,000! As I am really interested in architecture I learned that in Timbuktu there are only biggest buildings in city and all of them are mosques. They are bulit in Sahelian style. Looks imressive and extraordinary. Something that grabbed my attention is that a huge number of valuable ancient manuscripts were being hidden from destruction not only in Medieval times, but also in modernity. Which is sad. I was interested to find out that it was a real place! Also to find out that the temps there are usually hot! Such a sad thing for it to be so consumed by war though. Sadly, I never knew anything about Timbuktu, but now I do. I just learned that their inhabitants speak mostly Koyra Chiini that is a Songhay language. I love learning about different languages, so I am going to do more research on the languages of Timbuktu. I didn't know the situation in Timbuktu was that bad and it was under attack so many times. Good work Postcrossing to support them and of course I hope to recieve one of these cards. But more important I hope everything is going to be better soon for all the people who live there. The main treasure of Timbuktu is more than 100 thousand manuscripts - ancient manuscripts in biology, astronomy, history, mathematics, music, piety and other sciences. What a lovely project, I have always been curious about Timbuktu, and it's so sad to hear what is happening there. I didn't know that their main trading industry is in salt. And that they have so many ancient manuscripts covering so many topics. It has such a rich history. I love their creativity!!!! The whole section on the libraries amazed me, especially the man who save many of the ancient manuscripts. Hello. How sad that in the world is still a large number of countries in which it is so difficult to live a peaceful life. It's great that Phil, Bintu and Ali can tell us Timbuktu's story through wonderful cards. Guys, good luck and happiness! The camel caravan, or Azalai, was still being used to haul 30kg slabs of salt (four slabs to the camel) 800km from Taodenni to Timbuktu in 2017. They also offer a tourist option to ride a camel for two weeks north to Taodenni, or a 4-wheel drive truck for three days. When the salt trade began about 1000 years ago salt and gold were worth the same by weight. Pictures easily findable online of the salt mines, the camel caravans, the Timbuktu salt markets, and the Mopti salt transfer port are fascinating. Hi Postcrossers! I'm Hajar from Malaysia, this is my first time hearing a place called Timbuktu which i think it is such a unique country from its name. I bet there's a lot of people out there never heard of Malaysia before as it is indeed a very small country in Asia. But I thought that the man in the photograph is really an amazing man as he tries to preserve the traditional postcarding way by selling postcard in addition of generating income. i believe he did a good job! Thumbs up! I learned that while French is the official language, the majority of people speak Koyra Chiini. I listened to a bit and it is a very beautiful language. I know about Timbuktu was once a commercial center in Sahara Desert. But now the business declined...It's famous for its mosque buildings. Hope one day I can travel to there! can we have their address to send a postcard? I heard sometimes about timbuktu. Then read about it for several times on some books. Intetesting place! I think this is a great project. What i have learned recently about Timbuktu is, that it was one of the most educated places until in the late 16th / early 17th century the armies of the marrocan Sultan took over and killed all schoolars who urged resistance. I haven't thought that Timbuktu is really exist :) I'd like to visit that place. What a great giveaway! I mostly know of Timbuktu in the context of the Northern Mali conflict - how Mali is overrun with radical Islamist organisations with ties to Al Qaeda, which destroyed many historic sights in Timbuktu for "idolatry", and how Toureg tribes native to this region fought for liberation of the Northern region of Mali and declared an independed state with the capital in Timbuktu, but the independency was declined by UN and they officially rejoined Mali with hopes for more autonomity. However, the confilct caused numerous war crimes from both sides and, as far as I heard, the situation with human rights is far from being normal. So it's great that initiatives like that can provide some income for the local people! well, i know Timbuktu from one of Indonesian Influencer, his name is Raditya Dika. and i know it from his Instagram timeline. I remember when I first got to know that Timbuktu really existed! It's a country that has a lot of myths around it I think. We also have some Dutch sayings about it and I read a children's book of Dutch writer Carry Slee that has the country as a title, but then in Dutch: Timboektoe! I remember reading about the man who smuggled a number of manuscripts out of Timbuktu for safe keeping. Interesting to note that the people there mistrust the government efforts to preserve the documents hidden by families around the city. I imagine it would be hard to give up a piece of history that you have been entrusted with by grandparents etc. Timbuktu is a very ancient place, so we shouldn't, we must honour it as a real heritage of humanity and history. I have learned that in Timbuktu there is THE unique mosque made from only clay. Unfortunately,due to desert's sand and wind, this spectacular place may be lost ever. Initially thought of Timbuktu as an imaginary destination, it's was an eyeopener when I read that it's in Mali & I now know that it is a sister city to Marrakech (another ancient city with rich history) in Morocco. This indeed is an excellent initiative & we hope that we can help the city & its citizens get thriving again. It was fascinating for me to find out that Timbuktu was (and still is) on an ancient trade route for the salt mines approximately 600 km north. While the salt used to come by camel, (the caravans carried food to the mines as well on the reverse trip), it is now done across the desert via truck, although there are no roads. What a wonderful project, thanks for sponsoring this! i just learned that Timbuktu is really exist ! an ancient city from 14th century in Mali, north of Niger river. definitely i learn a lot from this web Postcrossing, especially about geography. What a great idea, I'd love to win a postcard from Timbuktu! I actually learned where Timbuktu is located - I didn't knew this before. Thank you for this oppurtunity! Thank you dear RosaRosae for recommending a book! I've just ordered this book online, hope to read it soon! Sounds interesting!